At Acer’s 2019 global press conference Next @ Acer, the company announced its new brand of premium desktops, notebook PCs, and monitors designed for professional creators. 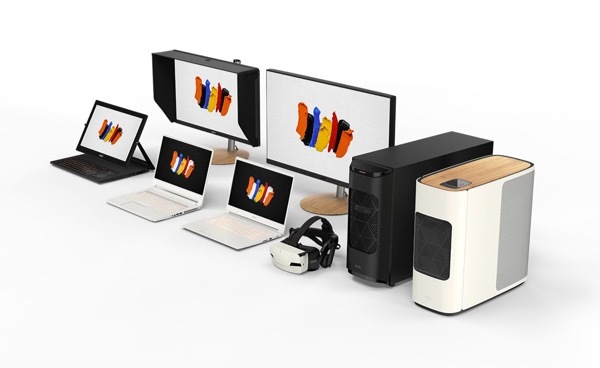 In New York, Acer unveiled Thursday a full lineup of new products under its new ConceptD brand, a collection of high-end desktops, notebooks, and monitors optimised for today’s professional creators: graphic designers, filmmakers, engineers, architects, and developers. The ConceptD 900 desktop will retail for US$19,999, and the 500 will retail for US$1,699. Both models will be available in North America starting in July, in EMEA in June, and in China in December. The trio of ConceptD notebooks all feature 4K UHD IPS Pantone Validated displays that make colours as true to life as possible thanks to 100% coverage of the Adobe RGB colour gamut, one of the widest digital colour ranges to date. Each model is nearly silent thanks to an Acer AeroBlade 3D Fan that makes the laptops as quiet as libraries. The ConceptD 9, 7, and 5 notebooks will start at US$4,999, US$2,299, and US$1,699, respectively. The 9 will be available in North America, EMEA, and China starting in August. The 7 will be available in both North America and in EMEA in July and in China in May. The 5 will be available in North America and China in June and in EMEA in July. This pair of Acer monitors produce extremely accurate colours by covering 99 percent of the Adobe RGB colour space. While the 32-inch CM7321K has been optimised for 2D creators, the 27-inch CP7271K is for those who create 3D content. The ConceptD CM321K monitor will start at US$2,999 and will be available in North America and EMEA in September and China in August. The CP7271K monitor will start at US$1,999 and will be available in North America and EMEA in July and China in June. Acer launches full product line for creators 0 out of 5 based on 0 ratings. 0 user reviews.